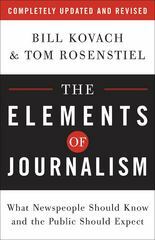 The Elements of Journalism 0 Edition The Book That Every Citizen and Journalist Should Read“What this book does better than any single book on media history, ethics, or practice is weave . . . [together] why media audiences have fled and why new technology and megacorporate ownership are putting good journalism at risk.” —Rasmi Simhan, Boston Globe“Kovach and Rosenstiel’s essays on each [element] are concise gems, filled with insights worthy of becoming axiomatic. . . . The book should become essential reading for journalism professionals and students and for the citizens they aim to serve.” —Carl Sessions Stepp, American Journalism Review“If you think journalists have no idea what you want . . . here is a book that agrees with you. Better—it has solutions. The Elements of Journalism is written for journalists, but any citizen who wonders why the news seems trivial or uninspiring should read it.” —Marta Salij, Detroit Free PressThe elements of journalism are:* Journalism’s first obligation is to the truth. * Its first loyalty is to citizens. * Its essence is a discipline of verification. * Its practitioners must maintain an independence from those they cover. * It must serve as an independent monitor of power. * It must provide a forum for public criticism and compromise. * It must strive to make the significant interesting and relevant. * It must keep the news comprehensive and proportional. * Its practitioners must be allowed to exercise their personal conscience.